Two Beers Brewing | Beer Blotter: Seattle based. World focused. The line at Black Raven. I’ve decided to use the “Top 5 Lists” column to go ahead and give a brief dissertation on the Washington Brewers Festival. 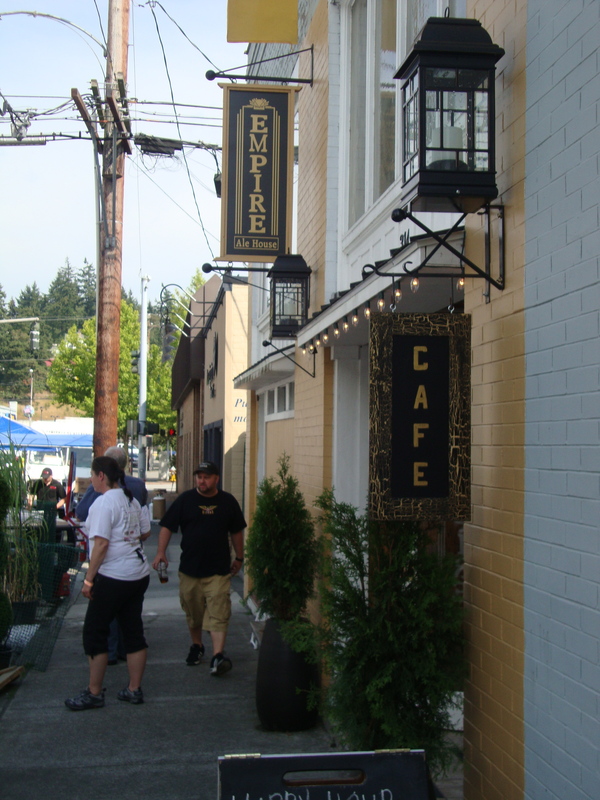 WaBF happened this past weekend out in Kenmore, Washington. We went out and had a blast. As you might remember, we typically use this column to discuss our five favorite places for a beer in cities across the globe. There are quite a bit of cities – we travel often. We plan on discussing the event more this week, but the time being, I wanted to share my five favorite places to have a beer at WaBF. This is a bit strange, considering its really all one place – a tent in one big field. But the column is more about the five great situations that I experienced at WaBF, and why I think they are significant. We cannot be everywhere. Typically when we visit an event, we have limited time. This severely limits what we can visit. If there is a critically-acclaimed otherworldly thing to do that we did not make it to, we will try and asterisk it in the Top 5 list so that you know it exists. We are not millionaires. Wow, bet you could have guessed that one. We cannot purchase the best of the best all of the time. This limits what we might get out of a particular event. Just want you to know. We like all types of things. These lists are not “beer nerd” centric – far from it. In fact, you may find things that make you shake your head. 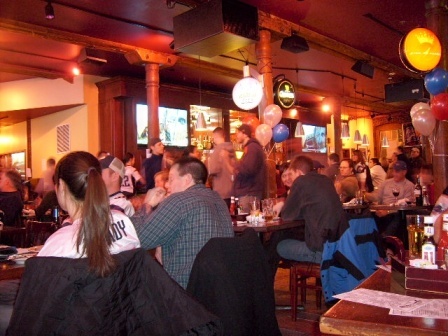 But, if they have the total package of beer, character, service, food and aura – they get the mark. We try to poll our choices, but sometimes there is bias. This one doesn’t apply today – I am taking over. Ok, now that we are through with the rules, lets move on to the Top 5 list for the Washington Brewers Fest. Visits: Every year since 2007. This year, I attended on Friday, June 18, 2010. Area Brewers of Note: Probably every brewer in the great state of Washington (though not likely) and a few specials from out of state (Dogfish Head and Goose Island, among others). But this even included tiny nanobrewers 192 Brewing and Foggy Noggin Brewing. 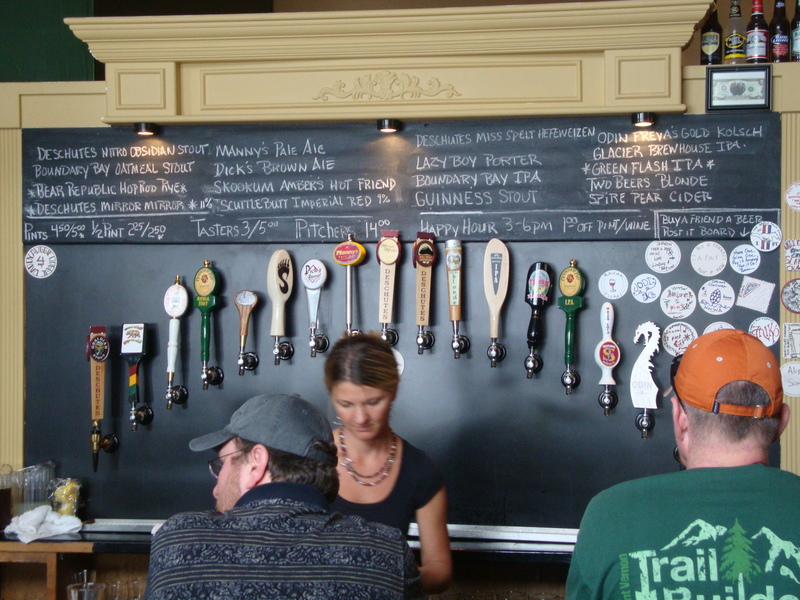 Festival Favorite: Look at the line above – Black Raven Brewing Co. In a short time of just over a year, this brewery had won the heart of locals and the attention of outsiders. I even had a discussion about them with the owner of Cigar City Brewing in Tampa, FL! They are making waves. Well we have to pull for our own, don’t we? Beer blogging is becoming a popular form of art. As more and more people become intrigued by the craft beer world, more and more local breweries find market share. This forces more and more localization of beer for the public, with even tiny nanobrewers finding a place to sell their goods. All of this lends to one thing – a need for local beer communities. The local beer community in Seattle has spawned several beer-centric bars, craft bottle shops, micro and nanobrewers and now even local beer bloggers. Most bloggers do what they do because they simply love beer – and they recognize the need for a local resource. Believe me, no blogger thinks that they are the source, but if we can shave some time of your adventure through beer, steer you towards the great venues and give you a head’s up on happenings – we are lending a hand to the beer community. When I saw that the two most read (probably) beer bloggers in Washington state had booths at WaBF, it made me proud to be a blogger. Seattle Beer News and Washington Beer Blog are written by Geoff Kaiser and Kendall Jones, respectively. Both of these guys do an excellent job writing about beer in Washington state. I tip my hat to each of them for their commitments to great material. But, now they are even be accepted into the brewers world. 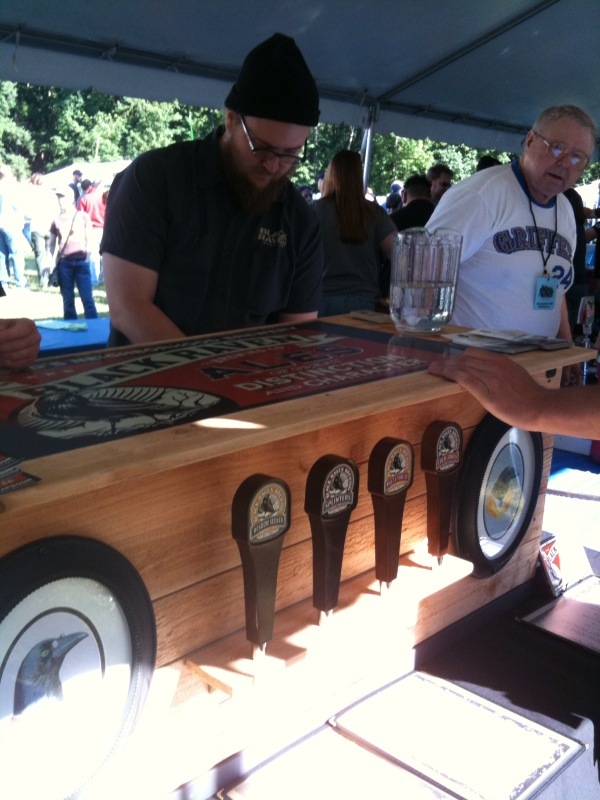 WaBF is a festival for the brewers and it was a bit touching to see that Washington Beer Commission was willing to include both these great resources. Kudos to the event; kudos to Geoff and Kendall for jumping in. Some time ago, I wrote an article on BeerBlotter.com about some of the nanobrewing spots that you could visit around Seattle. Later on, the focus of that story, Gilligan’s Brewing Company, became the center of a story by magazine, All About Beer. Its funny to look back at that article now and think: those guys were nanobrewers?! Yes, I might have played down the extent of brewing operations over at Seattle brewers Big Al Brewing, Two Beers Brewing, Schooner Exact Brewing, and Fremont Brewing. Big Al can be found all across Washington state, Two Beers is the house IPA tap at many of my favorite bars, Schooner Exact recently opened a tap room with over 10 beers, and Fremont Brewing is now in the process of canning! These guys are no longer the little guys on the block. But, there have emerged a new breed of nanobrewers in the greater Seattle area. One of my favorite things to see at this years event: the little guys having a place to pour. My favorite might be 192 Brewing, who is doing what they do – all in a 192 square foot space. This is what its all about. It doesn’t take $500,000.00 to get started, it doesn’t require a warehouse. All you need is some love and a few good test batches to make a tasty beer that the public can enjoy. 192 has the right idea. Similarly, Foggy Noggin made my little eyes weep. These guys are making beer on a 1/2 barrel (15 gallon) gravity system, similar to the one that BeerBlotter.com brews on. I was so proud to see these guys, without all the wonderful equipment of its surrounding brewers, put out some good brew. It does a homebrewer proud. I hope to see more of this over the next year. It doesn’t take much to add another tent or two to WaBF (I assume). Maybe we’ll even see some home brewers involved in the next few years. 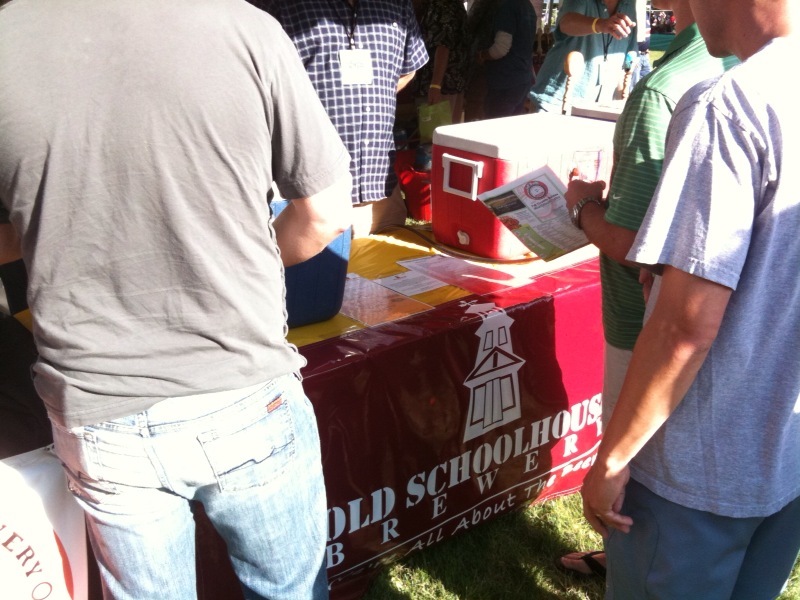 Old Schoolhouse - bringing flavor from up North. I was just out in Wenatchee and made a quick stop in Leavenworth for some cheese and brats at the Munchen Haus. When we were down in the Cheesemonger, tasting some damn good cheese, we saw some bottles from Washington brewers – brewers we had never heard of. What we saw were bottles from Old Schoolhouse Brewing. This brewery and pub is located out in little ole Winthrop, Washington – in the south end of the Okanogon National Forest. We met the owner and brewer, a father and son, respectively, and were utterly impressed with their kind demeanor and their tasty beer. Our favorite: the Imperial IPA (coming in at 9.6% ABV!). Old Schoolhouse was just one of many rural brewers that us city folk down in Seattle do not regularly get to try. Because of a dense brewer population in the greater Seattle area, its difficult for a rural brewer to find tap space at your bar. So WaBF is one of those great events where you finally get to try some of their concoctions. Other rural brewers of note were Skookum Brewery, out in Arlington, WA, Snipes Mountain Brewing, down in Prosser, WA, and Flyers Restaurant & Brewery, up in Oak Harbor, WA. Each of these brewers showcase wonderful ales, including top notch IPAs from Skookum and Snipes, and a potentially best in show porter from Flyers. If you get a chance to try their beers – grab one, its not everyday you see them. After awhile, you’ve just had too many IPAs. You want something a bit different don’t you? You want something that makes you go – What the &%$((%$?! In the past few years, we have seen the emergence of more creative recipes, a larger presence of wood-aging, and yeasts we cannot pronounce. Most of this shift is due to the success of sour beers, higher alcohol beverages, and fearless brewers like Dogfish Head, Lost Abbey, Jolly Pumpkin and Avery Brewing. I also very much enjoy the slow emergence of more and more French and Belgian Farmhouse style ales. I have never seen so many, Biere De Garde, Saison and general white and wheat ales. I was very impressed with Double Mountain and Rock Bottom saisons. Its a welcome change. Lets keep it up brewers. No more messing around. Crown them. You’d think I’d spend the most time talking about the #1 place on the list. But, this is a bittersweet love. As much as they deserve #1 – the place was inundated with a line that was no less than 10 times the length of any other line at the fest. Kudos to Black Raven for arriving on the scene – and blowing it to smithereens. Black Raven is the best beer producer in Washington state. Its settled, there can no longer be a debate. The buzz behind everything they do can no longer be silenced, can no longer be inhibited. They are officially playing the role of the most popular brewer in the state. Well, its not just a fad. Its really good beer, creative beer, inventive beer, flavorful beer and selective beer. They showcased several titles at the WaBF – every single one was impeccable. The Wisdom Seeker Double IPA is perhaps the best in the nation at its style. The bourbon barrel scotch ale was my #2 beer at the event. The Coconut Porter and the Malt & Vine 3rd Anniversary are both Top 20 beers as well. Look – we know they are good. Beer bloggers are helping to create this following with our perpetual ogling over all that they do. But, that being said, we cannot stop. No matter how big the buzz, we continue to peg them at the top of the list. Nothing changes over here at BeerBlotter.com. Black Raven rules Washington beer. 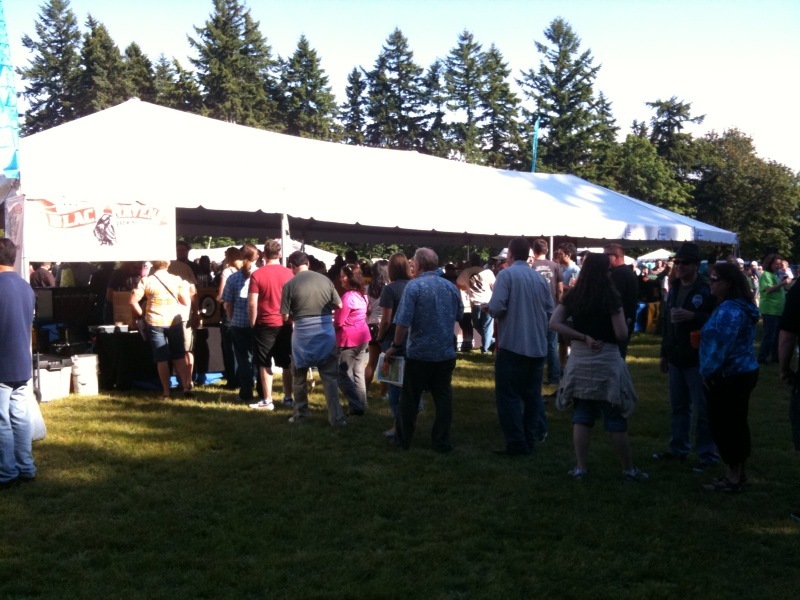 Live in Washington Beer Festival? Know the event? Hate something we wrote? Let us know below in our comments, or by sending an email to beerblotter@gmail.com.